Microsoft and anime girls are not strangers in Japan. In fact, you could say that Microsoft and Japanese anime girls are a thing. And not a new thing at that! For Windows 7, Microsoft had an OS character—or OS-tan, as they're called. OS-tans are anime personifications of operating systems that are created online by fans. Microsoft created an official OS-tan for Windows 7 named Nanami Madobe. However, now that Windows 8 has been released, Microsoft created two new OS-tan. Their names are Yuu Madobe and Ai Madobe. Why the name Madobe? Madobe (窓辺) means "by the window". So punny! 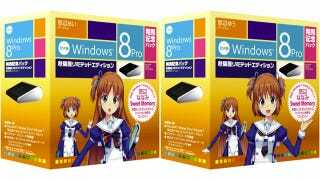 The first look at these two new OS-tans comes via retailer Tsukumo's listings for the Microsoft Wedge Touch Mouse with emblazoned Windows 8 logo. There are four OS-tan mouse bundles—two for each girl, with one set limited to sale in Tokyo's geek district, Akihabara. The bundles come with special OS-tan packaging (either Yuu or Ai), wallpapers, and "event sound" effects. The Akihabara bundles get the voice of each OS-tan.